Here you will find anemometers for the measurement of air velocity and air pressure. According to the type of application, anemometers are made as hot wire anemometers or pocket weather anemometers, all of these anemometers can measure air velocity and air pressure. The measurement results can be stored in memory of the device (depending on the model). There are a lot of different instruments available in our stores. These Anemometers are ideal for taking quick or constant measurements. Anemometers for measuring air velocity and volume flow are available here. The pocket-sized anemometers are implemented as hot-wire anemometers, vane anemometers, cup anemometers or portable, waterproof anemometers depending on the particular application. You will find the appropriate anemometer for each sector from industry over handwork to your hobby. With these anemometers air-conditioning systems as well as ventilation systems can be monitored with regards as to their performance. Moreover anemometers will be used when sailing to determine wind velocity. Anemometers are the basic instruments necessary for metering your site's wind speed. For wind turbine projects, where 0.1 m/s difference in the long term wind speed can make the difference between a viable and unviable project, it is worth investing in good quality anemometers. Since some of our instruments for the measurement of wind possess a data logger function, it is possible to store the measured data on internal storages. Moreover it is possible to transfer the measuring results to a computer later-on in order to guarantee easy data storage and further analysis. Attachments and ISO calibration certificates are also available for these measurements (information: calibration of anemometers). Here you will find a table with wind velocities and their broadly classification. In addition to that, extensive accessory is available for our instruments. Our technicians and engineers are available to assess your needs and recommend the best suited solution and any of our other products, simply call our offices on: UK customers +44(0) 23 809 870 30 / US customers (561) 320-9162. Our engineers and technicians will be happy to help you with our measuring instruments and of course, with the other products in the field of regulation and control, and scales and balances. 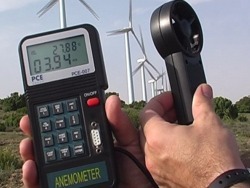 Some Wind speed measuring devices, for example, the PCE-007 and the AVM-4000 have internal memory and can transfer the data to a computer for further analysis by means of an RS-232 cable and appropriate software. The following images show two Air velocity meters in use. On the left we have the PCE-007 anemometer measuring air velocity in an installation of ecological turbines; to the right is the PCE-009 anemometer measuring air current of an extractor in a paint room. As you can see, the use of that mobile meters is practically unlimited. The anemometer (in Greek anemos = wind) tend to measure wind velocity. The wind velocity will be standardized with an anemometer at an elevation of 10 meters since ground wind velocity varies extremely locally. The measurement can be made thermally (hot wire anemometers), by wind cooling of a heat wire as well as mechanical (side wheel wind measuring meters) or by pressure (pitot tube anemometers) depending on construction type. The newest technology uses ultrasound. These kinds of devices are very expensive compared to the additional value of a better result. A sensor element will be heated up by electricity while using a hot-wire anemometer. 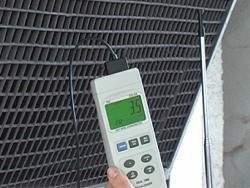 The electrical resistance changes due to heating of the component of the thermo anemometer. The heat will be emitted into the environment owing to the passing ait flow. The transfer of heat is connected with the flow velocity. The hot-wire anemometer measures the electrical parameters. So the hot-wire anemometer can draw conclusions with reference to velocity of flow. The sensor in a thermo anemometer can be executed as wire, similar to the Hot-wire Anemometer PCE-009, or like thin film similar to the Thermo Anemometer PCE-423. The measurement with a thermo anemometer always takes place in dependence with wind direction. Hot-wire anemometers are often used for blower door measurements. An angular momentum will be triggered by wind that encounters the vanes when using a vane anemometer. The anemometer presents the emerged rotation on the display. For instance, a forked light barrier gives the measurement impulse to the evaluation electronic during the usage of the vane anemometer. Problems with the vane anemometer occur due to the start-up speed since a certain wind velocity is needed to drive the vane. Modern vane anemometers avoid these problems, since they are executed very small and so frictional force at the anemometer can be minimized. It must be kept in mind that measuring direction-independent with a vane anemometer is impossible. Vane anemometers are often used for sailing or aviation sports. The measurement of wind velocity with a pitot tube anemometer is preformed via differential pressure. The pitot tube anemometer documents the pressure, that encounters the pitot tube as well as the pressure that exists around the pitot tube. Through the measurement of differential pressure and a conversion the pitot tube anemometer can conclude on the velocity flow. Pitot tube anemometers are used to measure high velocities of flow. The pitot tube anemometer can also be used in the aircraft industry or in motor racing. The measurement direction of the anemometer is always the wind direction. Cup anemometers are used when wind force should be determined direction-independent. The operational principle is similar as for vane anemometers. The wind encounting on half shells triggers an angular momentum: This angular momentum will be transformed into electrical signals via electronics. The presentation of wind velocity at this cup anemometer usually takes place on an LC display. Cup anemometers will be used in meteorology or for determination of wind situations before commissioning of wind power station. For this purpose the wind logger PCE-WL1 will be used often. The ultrasonic anemometer works with 4 ultrasonic transmitters and ultrasonic receivers respectively. A propagation delay of the signal is caused due to the wind that flows between the ultrasonic components. The ultrasonic anemometer measures the delay; therefore it can draw conclusions regarding the flow velocity. The advantage of an ultrasonic anemometer compared to a conventional anemometer is that no wearing parts exist. Another advantage is that along with the flow velocity the flow direction can be measured precisely with the ultrasonic anemometer. The ultrasonic anemometer will be used in meteorology, agricultural industry as well as in shipping. Since for many of the anemometers the volume flow of a flow channel can be shown on the display directly by indicating the cross sectional area. Therefore complicated conversion can be avoided since the formulas saved in the measuring instrument contain weighting for edges of flow or core flow at the same time. Please note that the probe of the measuring instrument (propeller, thermal flag or pitot tube) has to be hold centrically and absolutely in flow as well as in flow direction. You can also elliptical drive along the flow cross-section (for devices with averaging calculation) to reach optimal solutions. Directional arrows are affixed on many anemometers. Please note the enclosed instructions for using. If you place the sensor the wrong way around into the air flow wrong measurement results can occur or the anemometer can even be destroyed. For instance, by using devices with impeller due to the fact that the impellers have a fixed running direction. Please make sure that no dust particles are in the air you want to measure since thin flag can be destroyed easily by impacting particles. Since the sensor is the most important as well as most expensive part of the device the complete anemometer would be unusable in case of destruction. Please use a vane anemometer for light charged media or a pitot tube anemometer as of a minimal flow velocity of 5 m/s. These devices are very accurate, extremely robust and cover a wide range of velocity. in Polish in Serbian in Russian in Turkish and in Portuguese .